LEITCH, WILLIAM, Presbyterian clergyman and educator; b. 20 May 1814 at Rothesay on the Isle of Bute, Scotland, son of John Leitch, a customs officer, and Margaret Sharp; m. Euphemia Paterson in 1846, and they had four sons; d. 9 May 1864 at Kingston, Canada West, and was buried at Monimail, Fifeshire, Scotland. 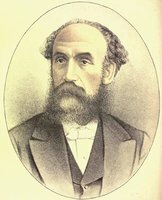 In 1839, after two years at the University of Glasgow Divinity Hall, Leitch was licensed to preach as a minister of the Church of Scotland. He did not break with the church during the “great disruption” of 1843. In that year he was ordained and presented by the Earl of Leven to the parish of Monimail in the presbytery of Cupar. For the next 16 years he gave himself up to his parish duties, to his studies, and to the work of the General Assembly. There, as convenor of the committee on Sabbath schools, he interested himself particularly in popular education. He was a man of genial personality who made many warm friends. In 1859 two trustees of Queen’s College at Kingston, the Reverend John Barclay and Alexander Morris*, were sent to Scotland to find a successor to the retiring principal, the Reverend John Cook*. The General Assembly recommended Leitch to them, although expressing the belief that he might have a more distinguished and useful career in Scotland. He was already well known for the writings on science and religion he had published in the Scottish Review and other periodicals. It may have been a special interest in educational matters that induced Leitch to leave these agreeable occupations in order to build up the little college at Kingston. Leitch was appointed principal of Queen’s at a salary of £600 a year from 1 June 1860. He arrived at Kingston in October and expressed much pleasure at the quality of the students there, pronouncing them “quite equal to the students at home.” He was optimistic about the future of the college. During his principalship he did much to develop the theological faculty, and he added to the existing faculties of theology, arts, and medicine the new but short-lived faculty of law in 1861. He accepted for Queen’s the management of the local observatory, of which N. F. Dupuis* was appointed “observer,” and the accompanying responsibility of arranging for public lectures on astronomy and other scientific subjects. In 1862 he published his best known work, God’s glory in the heavens. He was also associated with Dr George Lawson*, the professor of chemistry, in establishing a botanical garden and in the founding at Kingston in 1860 of the Botanical Society of Canada, of which he became president in 1861, and of the society’s Annals, to which he contributed. For the first year or two of his principalship Leitch was deeply involved in the question of university education in Canada West. Along with S. S. Nelles*, the principal of Victoria University at Cobourg, he claimed for Queen’s, as a constituent college in the provincial university at Toronto which had been envisaged by the University Act of 1853, a share in the endowment and the government of the university. He believed that university education should be carried on in colleges, and he advocated following the Scottish pattern of a number of small colleges at various places throughout the province conducting their own teaching in their own way and requiring their students to write university examinations for a university degree. In 1861 a commission which included Leitch’s friend and colleague on the Queen’s board of trustees, John Paton, proposed a plan by which the colleges might be associated with the University of Toronto in the manner suggested by Leitch. Under this plan too, the colleges would have secured the needed support from the university endowment. Hoping that the plan might be adopted, Leitch for a time served on the senate of the University of Toronto and as a university examiner. The senate, however, was strongly opposed to the views of the commissioners, and its influence brought about the rejection of the proposals. The University of Toronto retained complete control of the entire endowment. Fortunately, the provincial government had in 1860 increased its grants to Victoria and Queen’s from $3,000 to $5,000 yearly. Leitch, as a distinguished clergyman and scholar and as principal of Queen’s College, was welcomed by the Synod of the Presbyterian Church in Canada in Connection with the Church of Scotland. His name was entered on the roll of the synod in the month of his nomination as principal, November 1859. Absences in Scotland prevented his attendance at the synod meeting held in 1861; he was elected moderator for the year 1862–63. At Queen’s, however, Leitch was facing disappointment and failure. The college was deeply divided by personal quarrels and by conflicts of principle which had arisen between the senate and the board of trustees. The professors at Queen’s, most of them graduates of Scottish universities, claimed life-long tenure of their “chairs” and maintained that the senate, although created by the board of trustees; could, once created, exercise its powers of academic discipline independently of the board. The question of the distribution of powers within the college was a difficult one. Leitch, having no previous knowledge or experience of the complexity and bitterness of academic quarrels or of the special problems of Queen’s, underestimated the seriousness of the situation. He accepted too readily the views of the trustees and gradually found himself alienated from almost all his academic colleagues. Out of a staff of some 12 professors, three, James George, Lawson, and John Dickson*, resigned and two, John Stewart and George Weir, were dismissed during his administration of three and a half years: a result not so much of Leitch’s policy as of deep-seated disagreements and resentments which had built up over the previous decade under a series of overworked acting principals. Leitch’s health, never robust, broke under the strain, and he died after considerable suffering in May 1864. William Leitch’s writings include God’s glory in the heavens (London and Edinburgh, 1862; 1863); Introductory address at the opening of Queen’s College, Nov. 8, 1860 (Montreal, 1860); and Vindication of the General Assembly’s resolution to accept grants in aid, as offered in the despatch of the hon. the court of directors of the East India, Co., of July, 1854 (Edinburgh, 1857); as well as articles in Botanical Soc. of Can., Annals (Kingston, Ont. ); British Assoc. for the Advancement of Science, Report (London); Good Words (London); and Scottish Rev. : a Quarterly Journal of Social Progress (Glasgow). QUA, Queen’s records, B, 1859–64; D1, 1859–64. Documentary history of education in U.C. (Hodgins), XVI–XVIII. Presbyterian (Montreal), XV (1862)–XVII (1864). Presbyterian Church of Can. in Connection with the Church of Scot., Acts and proc. of the Synod, 1860–64. Notman and Taylor, Portraits of British Americans, I, 258–66. D. D. Calvin, Queen’s University at Kingston: the first century of a Scottish-Canadian foundation, 1841–1941 (Kingston, Ont., 1941). Hilda Neatby, “LEITCH, WILLIAM,” in Dictionary of Canadian Biography, vol. 9, University of Toronto/Université Laval, 2003–, accessed April 24, 2019, http://www.biographi.ca/en/bio/leitch_william_9E.html.